Can One Divorce and Remarry for Adultery? 1) Where can we find the Our Father in the original Aramaic language of Jesus in both written and audio format. 2) Does the "exclusion clause" in Jesus' comments about divorce mean one can divorce and remarry if one spouse commits adultery? Jimmy Akin has more excellent infor on the Our Father on this at his blog. Check it out. Second, about "exclusion clause" in Matthew's Gospel. The "exclusion clause" is in underlined italics below. "So they are no longer two but one flesh. What therefore God has joined together, let not man put asunder." They said to him, "Why then did Moses command one to give a certificate of divorce, and to put her away?" He said to them, "For your hardness of heart Moses allowed you to divorce your wives, but from the beginning it was not so. And I say to you: whoever divorces his wife, except for unchastity, and marries another, commits adultery; and he who marries a divorced woman, commits adultery."" (Matthew 19:6-9, RSVCE). Now the word "adultery" is the Greek word porneia which is somewhat uncertain. There have been many explanations of this clause. Most Protestants have used it as an escape clause that divorce and remarriage is permissable if adultery is involved. The Fathers and the Catholic Church have always said NO — it allows divorce for porneia but never remarriage. It is clear that Jesus forbids divorce and remarriage under any conditions. The “exception clause” in Matthew 19:9 has been interpreted in various ways. But even if one maintains that one can divorce for the reason of porneia (the Greek word used by Jesus), there is no allowance or permission for remarriage. If someone divorces and remarries, even for a case of porneia, the party that remarries is living in adultery. Of course, all of this assumes the marriage is a sacramentally valid marriage. The Catholic Collegeville Commentary states: “Jesus’ teaching on marriage and divorce in Matthew 19, verses 4–9 first cites Gen 1:27 (v. 4) and Gen 2:24 (v. 5) to the effect that in God’s original plan of creation marriage was indissoluble and no human agent could end such a union (v. 6). In the Old Testament (see Deut 24:1–4) divorce was allowed only as a concession to human weakness. This was not God’s original intention (vv. 7–8). Once again Jesus assumes the role of the authoritative interpreter of the law, and in verse 9 he forbids divorce and remarriage absolutely, except for the case of porneia — most likely a marriage contracted within the degrees of kinship forbidden by Lev 18:6–18 (see the commentary on Matt 5:32 below). There is little doubt that Jesus regarded marriage as indissoluble (see Mark 10:11–12; Luke 16:18; 1 Cor 7:10–11)” (Bergant, D., & Karris, R. J. (1989). The Collegeville Bible Commentary: Based on the New American Bible with revised New Testament. Collegeville, Minn.: Liturgical Press). “The antithesis concerning divorce seems to repeal or reject the permission and procedure found in Deut 24:1. According to Jesus, divorce is not allowed (see Luke 16:18; 1 Cor 7:10–11; Mark 10:2–12; Matt 19:3–12). The Matthean versions of Jesus’ teachings on divorce include some kind of exception: “unless the marriage is unlawful” (5:32; 19:9). The Greek word is porneia, which refers to some sort of sexual misconduct or irregularity. In Acts 15:20, 29 porneia has to do with marriages contracted within the degrees of kinship forbidden by Lev 18:6–18, and thus technically incestuous unions” (Bergant, D., & Karris, R. J. (1989). The Collegeville Bible Commentary: Based on the New American Bible with revised New Testament. Collegeville, Minn.: Liturgical Press). Should Catholics Attend Protestant Bible Studies? "Should Catholics Attend 'Ecumenical' Bible Studies"
My new article Should Catholics go to Non-Denominational Bible Studies? appears in the January 2007 issue of THIS ROCK Magazine. In the article I recommend another article I wrote entitled How To Start A Parish Bible Study. In addition, here are a load of other Bible Study resources–click here and here. For Steve's Catholic Bible Study "St. John's Gospel: A Bible Study Guide & Commentary"
"Questions for 'Bible Christians' "
and Is This A Real Catholic Bible Study? and Can Bible Translations have Protestant Bias? For the best Catholic Scripture Study program for groups in English or Spanish, visit CatholicScriptureStudy or call 1-866-887-2774. This is an easy do-it-yourself Parish Bible Study program. The studies are written by myself, Scott Hahn and Mark Shea. 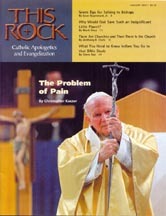 Also check out the excellent Catholic Bible Study for parishes at http://www.greatadventureonline.com by Jeff Cavins.